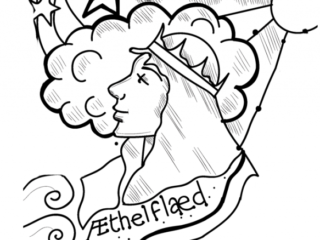 Æthelflæd, warrior queen of the Mercians. 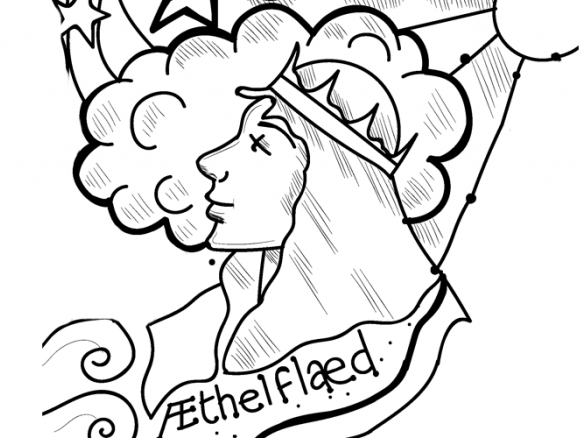 Æthelflæd, Lady of the Mercians (d. 12 June 918), ruled Mercia from 911 to her death in 918. She was the eldest daughter of Alfred the Great, king of the Anglo-Saxon kingdom of Wessex, and his queen, Ealhswith. Æthelflæd was born at the height of the Viking invasions of England. Her father married her to Æthelred, Lord of the Mercians. After his death in 911, she ruled; the Anglo-Saxon Chronicle referred to her as the Myrcna hlæfdige, “Lady of the Mercians”. Æthelflæd established garrisons in Hereford and Gloucester before 914 and repaired the old walls of Chester in 907. In 910 she built her first fortress; since her husband took no part in the campaign against the Danes, some scholars suggest that she was the real leader of the Mercian people. Æthelflæd was a formidable military leader and tactician and ruled for eight years. Upon succeeding her husband, she began to plan and build a series of fortresses in English Mercia, ten of which can be identified: Bridgnorth (912); Tamworth (913); Stafford (913); Eddisbury (914); Warwick (914); Chirbury (915); Runcorn (915). Three other fortresses, at Bremesburh, Scergeat and Weardbyrig, have yet to be located. Æthelflæd allied herself to her brother Edward the Elder, king over much of England. Historian Sir Frank Stenton said that Edward was able to achieve “the outstanding feature of his reign”, the move against the occupying Danes in the south of England, due to being able to rely upon Æthelflæd. In 916 she led an expedition into Wales to avenge the murder of a Mercian abbot, and succeeded in capturing the wife of the king of Brycheiniog. Edward the Elder issued coinage with novel reverses of extraordinary designs, and it is speculated that this series of coinage was for circulation in the part of Mercia under the rule of Edward and his sister, with the design of the coinage perhaps showing the influence of Æthelflæd.